Mike Ullery | Daily Call MedFlight Pilot Dave Pratt checks out the Kettering Hospital Troy location as he circles the new facility on Wednesday. 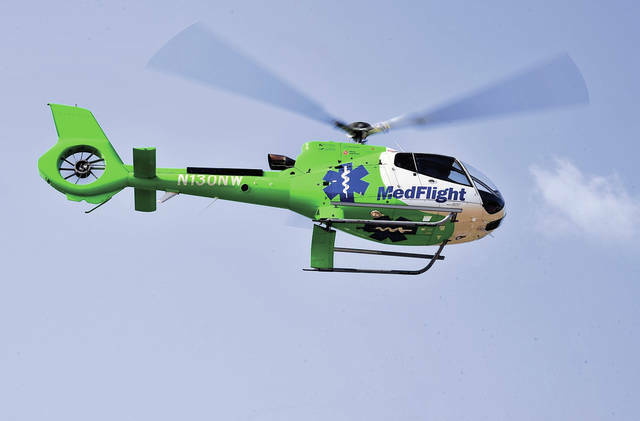 Mike Ullery | Daily Call MedFlight currently is available to Miami County EMS agencies, but the new Troy hospital will put another emergency room in Miami County, allowing patients another option for urgent critical care. MIAMI COUNTY — Visitors to Troy have been watching the progress as the new Kettering hospital Troy location has been rising from the former Hobart property at the corners of West Main, Elm, and Water streets. As construction progresses, Kettering Health Network is excited to let residents know of some of the services that will be available at the new facility. One of those services will be closer access to emergency helicopter trauma care than is currently available from Kettering. MedFlight currently is available to Miami County EMS agencies, but the new Troy hospital will put another emergency room in Miami County, allowing patients another option for urgent critical care. MedFlight is now a statewide operation with eleven aircraft — nine in-service aircraft along with two back-up helicopters. They are owned by The Ohio State University, Ohio Health and are partners with Kettering Health Network. MedFlight flight nurses said that they are excited to become a resource for the residents of Troy and Miami County. 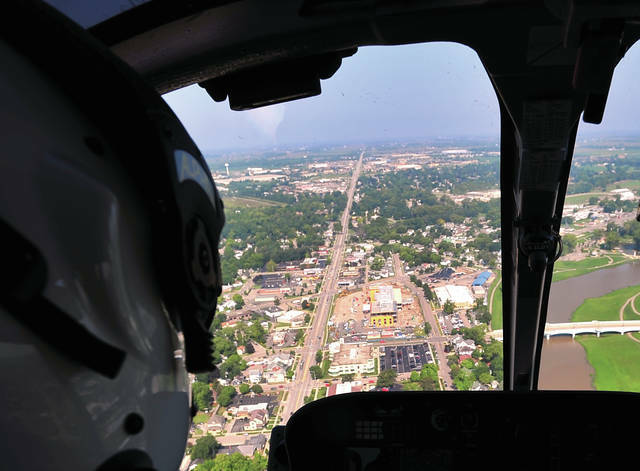 While helicopter medical service is mainly to Kettering affiliates, the non-profit program promises to do what is best for the patient in every situation. Kettering EMS Coordinator Tony Alexander discussed the outreach opportunities that Kettering will bring with them. MedFlight personnel will assist area fire departments in their continuing education and maintaining certifications. While the opening of the Kettering Hospital Troy facility is projected to be a year from completion, Miami County residents can expect to see a growing presence from Kettering Health Network and some of their most visible public relations ambassadors — the helicopters and crews from MedFlight. https://www.dailycall.com/wp-content/uploads/sites/30/2018/08/web1_082218mju_medflight1-3.jpgMike Ullery | Daily Call MedFlight Pilot Dave Pratt checks out the Kettering Hospital Troy location as he circles the new facility on Wednesday. https://www.dailycall.com/wp-content/uploads/sites/30/2018/08/web1_MU2_8654_cmyk-1.jpgMike Ullery | Daily Call MedFlight currently is available to Miami County EMS agencies, but the new Troy hospital will put another emergency room in Miami County, allowing patients another option for urgent critical care.